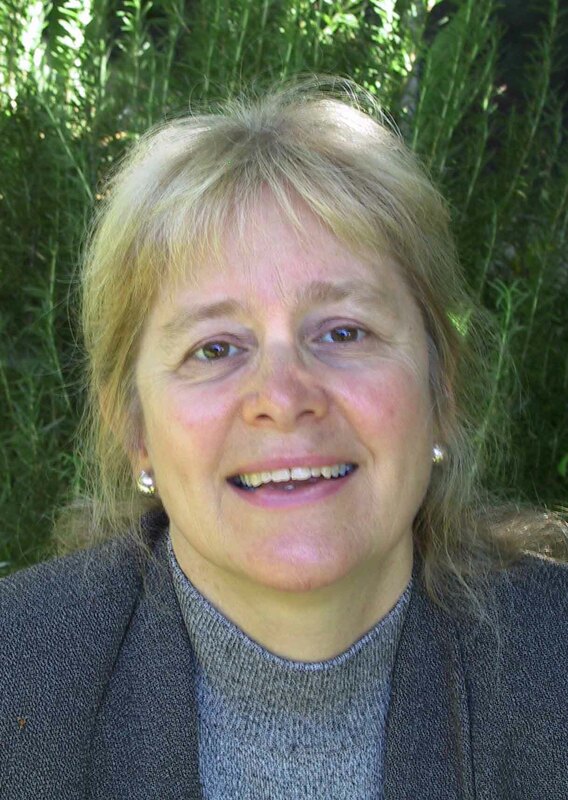 Recently we did a blog interview with author Mary Mackey talking about how her agent republished all of Mary’s out-of-print novels as e-books. A lot of agencies are doing this now. Some of them manage thousands of titles, and they are bringing them back in print, usually at very attractive prices. That’s good news for readers. I decided to do the same thing with my clients’ books. I’d like to describe the steps that I took to get an out-of-print book converted and published. It was really quite easy. The book I worked on was Face-Time by Erik Tarloff. He is a client of mine. 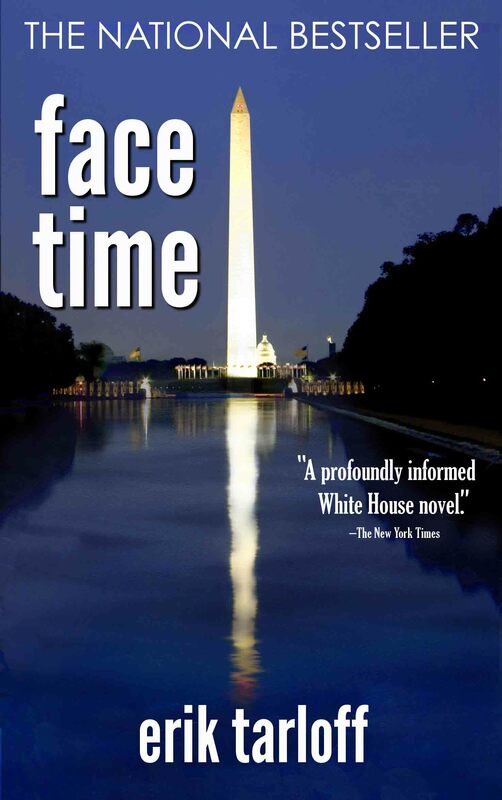 I first read Face-Time when it was published in 2000. I loved it then and I still do. The story is about a presidential speech writer in Washington who learns that his girlfriend is having an affair with the President. Erik’s voice comes through loud and clear. It is very funny and very smart. It moves effortlessly between high culture and low farce. Erik had some pretty good inside knowledge that gave this book a lot of verisimilitude. Erik’s wife is Laura D’Andrea Tyson who was Chair of both The Council of Economic Advisers and later The National Economic Council under Clinton, both cabinet level positions. Erik, himself, wrote speeches for the President. Erik is also quick to point out that this book is in no way a roman a clef. So let’s talk about how I got this book published. First, a word about e-book formats. There are two major digital formats for e-books. The first and most popular is the Kindle Format. It is proprietary and controlled by Amazon. com. Books in the Kindle format can only be read on Kindle readers (or a Kindle App from the i-Tunes Store) and only purchased at Amazon. Right now about 65% of all e-book sales are for Kindle Editions. The other major format is Adobe EPUB, an open source format. 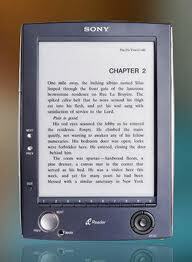 Most other major e-book retail venues and platforms (i-Pad, Nook, Kobo, Sony, Android) use the EPUB format. This means that if you are going to make your book available, you will need to go through the conversion process twice, once for each format. Ok. Let’s go through this step-by-step. 1) Create a word file. If Erik already had a .doc file of the text, I could have gotten it up in a few hours. But he didn’t. So the first thing I had to do was to send the physical book to an optical character recognition (OCR) service that scans the book and converts the text to a digital file. I chose Blue Leaf Scanning , a widely used service for this job. The price is based on the number of pages in the book. Face-Time had about 250 pages and the price was $26.95. I sent them a copy of the book. And two weeks later they emailed me back a word file and a .pdf of the text. 2)Review and Re-edit. The good news about optical character recognition scanning is that it is at least 99% accurate. The bad news is that it is only 99% accurate. What that means is that on any page of the scanned book, there are likely to be about 35 incorrect letters and consequently 35 misspelled words. Re-editing is essential and is the most tedious part of the process. So I turned it over to Erik. 3)Designing a cover. This is important for marketing. You really need one of those postage stamp size covers so that the book looks professionally published. I referred Erik to my friend and fellow-agent, Natanya Wheeler. She is an agent at the Nancy Yost Literary Agency and she’s great. She also manages their large list of re-published e-book titles and knows how to create a properly designed and formatted book cover. She agreed to design the cover for us. She charged Erik about $100 and produced a gorgeous cover in the form of a .jpg file. 4) Formatting for Kindle Editions. Amazon has made it pretty easy to get your book into the Kindle Store. Their program is called Kindle Direct. Publishing through Kindle Direct is free. Amazon will take a percentage of all sales. Go to the link and register. Then read the simple step-by-step instructions for formatting and publishing. It will lead you through a few formatting requirements, all of which can be done using Microsoft Word. These include: paragraph formatting, line spacing, preparing a title and copyright page, table of contents, and adding addition materials like author bios and blurbs. Then they show you how to convert your word file to a html file using your own MS Word program. 5) Upload and Convert. The next step is to take your html file still on your computer and upload it using Amazon’s simple instructions. You will also upload the jpg of your cover art. Doing this is a lot like uploading photographs on Facebook. You can then preview your book on a viewer on the Kindle Direct page that will make the text look identical to what you will see on the Kindle Reader. If there are formatting problems or other errors, you can correct them at this point. 6) Pricing. Amazon then directs you to a pricing page where you can determine how you want the book priced. It’s your choice. You can give it away for free or price it at $1000 and see if anyone buys it. (They won’t). I priced Face-Time at $2.99. I see a lot of books on sale at that price point. It’s low enough to avoid issues of price resistance. Typically the amount that Erik will receive on each sale is going to be 70% of the price. 7) Publishing. Hit the button and you are now a published author. It will probably take 12 hours before your book will have its own page on Amazon. 10) Wait for the big bucks to start rolling in. Both Amazon and Smashwords have very user friendly systems for sales reporting and payment of royalties. You can check these out on their websites. The hardest part of all of this is the writing. And if you look at most of the self-published books that are available, the quality is (how shall I say this politely?) spotty. But if you have a manuscript, regardless of the quality, it’s easy, cheap and fast to get it published. Of course no one’s going to read it if they don’t know it exists. And you probably aren’t going to get review attention for a self-published book, and you aren’t going to get an e-book into the bookstores. Since you’re the publisher, it’s your job to do the marketing. Good luck. Yesterday The Authors Guild posted a very interesting analyis about the dynamics of competition between Apple, Amazon, and Barnes and Noble as they jockey for the e-book market. The analysis came down very hard on Amazon. Today The Authors Guild has published an equally fascinating analysis of how the prevailing formula for author royalties on e-books unfairly diminishes authors’ income even as publishers earn more for each e-book sold. Below is the text of this analysis. To mark the one-year anniversary of the Great Blackout, Amazon’s weeklong shut down of e-commerce for nearly all of Macmillan’s titles, we’re sending out a series of alerts this week and next on the state of e-books, authorship, and publishing. The first installment (“How Apple Saved Barnes & Noble. Probably.”) discussed the outcome, one year later, of that battle. Today, we look at the e-royalty debate, which has been simmering for a while, but is likely to soon heat up as the e-book market grows. E-book royalty rates for major trade publishers have coalesced, for the moment, at 25% of the publisher’s receipts. As we’ve pointed out previously, this is contrary to longstanding tradition in trade book publishing, in which authors and publishers effectively split the net proceeds of book sales (that’s how the industry arrived at the standard hardcover royalty rate of 15% of list price). Among the ills of this radical pay cut is the distorting effect it has on publishers’ incentives: publishers generally do significantly better on e-book sales than they do on hardcover sales. Authors, on the other hand, always do worse. So, everything else being equal, publishers will naturally have a strong bias toward e-book sales. It certainly does wonders for cash flow: not only does the publisher net more, but the reduced royalty means that every time an e-book purchase displaces a hardcover purchase, the odds that the author’s advance will earn out — and the publisher will have to cut a check for royalties — diminishes. In more ways than one, the author’s e-loss is the publisher’s e-gain. Inertia, unfortunately, is embedded in the contractual landscape. If the publisher were to offer more equitable e-royalties in new contracts, it would ripple through much of the publisher’s catalog: most major trade publishers have thousands of contracts that require an automatic adjustment or renegotiation of e-book royalties if the publisher starts offering better terms. (Some publishers finesse this issue when they amend older contracts, many of which allow e-royalty rates to quickly escalate to 40% of the publisher’s receipts. Amending old contracts to grant the publisher digital rights doesn’t trigger the automatic adjustment, in the publisher’s view.) Given these substantial collateral costs, publishers will continue to strongly resist changes to their e-book royalties for new books. Resistance, in the long run, will be futile. As the e-book market continues to grow, competitive pressures will almost certainly force publishers to share e-book proceeds fairly. Authors with clout simply won’t put up with junior partner status in an increasingly important market. New publishers are already willing to share fairly. Once one of those publishers has the capital to pay even a handful of authors meaningful advances, or a major trade publisher decides to take the plunge, the tipping point will likely be at hand. In the meantime, what’s to be done? We’ll address that in our next installment in this series, on Monday. Our assumptions and calculations for the figures above follow. To keep things as simple as possible, we assumed that for hardcovers: (1) the publisher sells at an average 50% discount to the wholesaler or retailer (2) the royalty rate is 15% of list price (as it is for most hardcover books, after 10,000 units are sold), (3) the average marginal cost to manufacture the book and get it to the store is $3, and (4) the return rate is 25% (a handy number — if one of four books produced is returned, then the $3 marginal cost of producing the book is spread over three other books, giving us a return cost of $1 per book). We also rounded up retail list price a few pennies to give us easy figures to work with. “The Help,” by Kathryn Stockett has a hardcover retail list price of $25. The standard royalty (15% of list) would be $3.75. 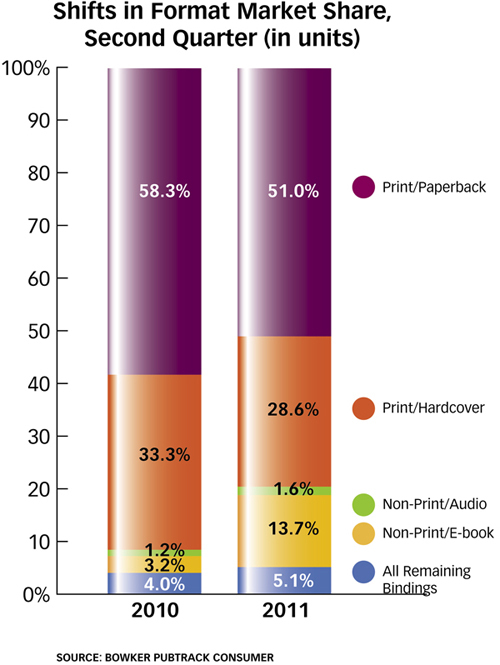 The publisher grosses $12.50 per book at a 50% discount. Subtract from that the author’s royalty ($3.75), cost of production ($3), and cost of returns ($1), and the publisher nets $4.75 on the sale of a hardcover book. “Hell’s Corner” by David Baldacci, has a retail list price is $28. The standard royalty is $4.20; the publisher’s gross is $14. Subtract royalties ($4.20), production and return costs ($4), and the publisher nets $5.80. “Unbroken,” by Laura Hillenbrand has a hardcover list price of $27. Standard royalties are $4.05. The publisher’s gross is $13.50. Subtract royalties of $4.05 and production and return costs of $4, and the publisher nets $5.45. 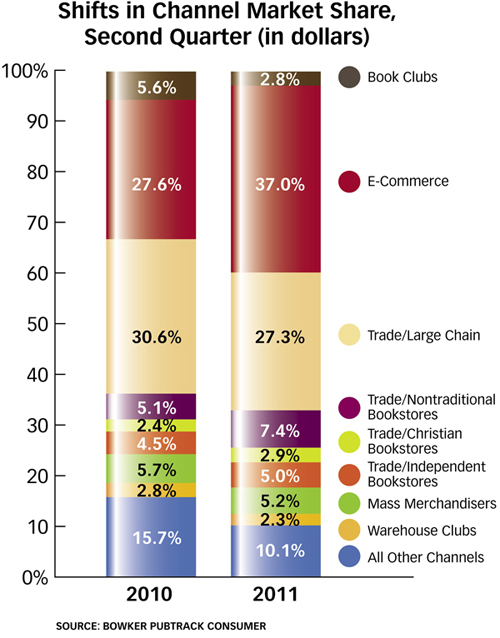 Under the reseller model, the online bookseller pays 50% of the retail list price of the book to the publisher and sells the book at whatever price the bookseller chooses (for bestsellers, Amazon typically sells Random House e-books at a significant loss). Random House frequently prices the e-book at the same price as the hardcover until a paperback edition is available. 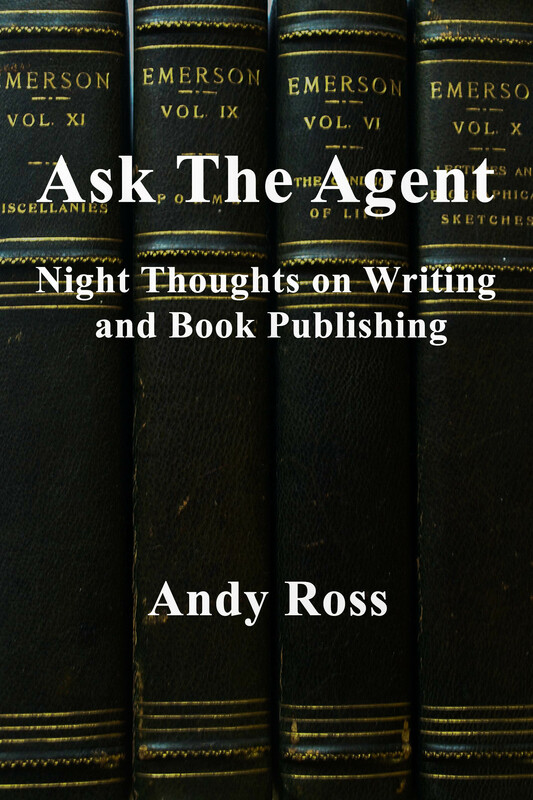 Under the agency model, the online bookseller pays 70% of the retail list price of the e-book to the publisher. The bookseller, acting as the publisher’s agent, sells the e-book at the price established by the publisher, but the publisher is constrained by agreement with Apple and others to set a price significantly below that for the hardcover version. The unit costs to the publisher, under either model, are simply the author’s royalty and the encryption fee, for which we’ll use a generous 50 cents per unit.